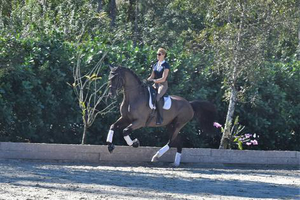 This is a breathtaking 13 yr old imported black Gelding by Herzruf out of a Black Magic Boy Mare standing 17h tall. Drake is a truly elastic, athletic boy with all the talent to go up to Grand Prix. He has successfully shown through PSG and is ready to move up! Just so much fun to ride! 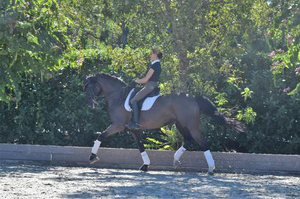 With lots of ground cover and freedom in his shoulders all lateral work is super easy for this beautiful boy. 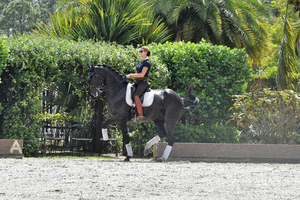 Great ability to collect his canter make his pirouettes and also his piaffe of very high quality. He truly is a head turner all the way! 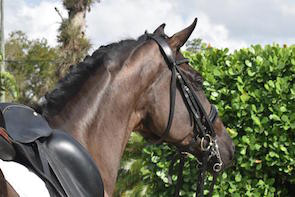 Drake is soft in the bridle and can easily do all the PSG work in the snaffle with a good motor, he is light on the aids but never gets to hot! 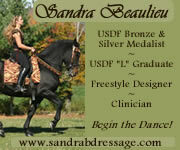 He would be a great horse for a JR, YR, AA Rider or professional alike. Hacking out is one of his favorite things to do besides looking for attention of course. Drake is an absolute sweetheart. He has very good ground manners and loads easily. Viewed 293 times since 1/20/19.